The CFA153B-S6-B is a Compact Vacuum Tube Stereo Amplifier with Bluetooth Wireless Connection Function, allows user to enjoy powerful music with high quality sound performance. The Small Size 6L6 Tube Hi-fi Amplifier design, suitable for music enjoyment by using limit space at home, office, shop or other comparable environment. 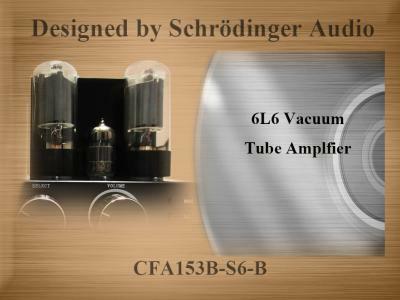 Home Audio Amplifier made of professional pure vacuum tube amplifier technology and design. Provides Pure, Smooth, Clearly Tones. Low Distortion, High Stability Audio system. The CFA153B-S6-B Vacuum Tube Bluetooth Amplifier have User Friendly Features: Two AUX inputs and can create the Bluetooth Sound System by build in Bluetooth Function. Both wired and wireless connection with Smartphone, Pc, Tablet Pc, MP3 player, CD player and other music player devices. Output to Audio Loudspeakers and Headphones.